Sweet Chaos Home: Pardon me, but do you speak Plumber? You know that annoying toilet tissue commercial where the women are telling us it's time to get real about what happens in the bathroom? Well, no one is more honest about that than a plumber. There are various terms used for the toilet area of a home. Some call it the loo, lavatory or privy. My preferred term is water closet. When I first met our plumber, Marty, I used the term "water closet" several times throughout our conversation. He finally looked at me and said, "Okay, so your crapper is going in that corner?" Well, that's one way of putting it. Another time I was inquiring about how many CFMs the bathroom vents should have. Marty said, "Well, I'd get 130 for the shower area, but all the crapper needs is a little fart fan." In a house full of boys, you'd think I'd be used to this language. But, somehow hearing it from giggling young boys is different. There's something about a person seeing the innards of your pipes that makes him feel like family. So I felt compelled to break through the language barrier and make Marty feel at home. When I was giving him an update on the plumbing supplies I'd ordered, I said, "The crapper's being delivered tomorrow, and the fart fan will be here next Tuesday." The look on his face said it all. We were finally speaking the same language. I know this blog is meant to be about design. But, perhaps if you're designing a bathroom in the near future, you may want to learn to speak Plumber and get real about what happens in the bathroom. Nicholas and I both had another good laugh after we saw you at Restoration Hardware....your little 5-year old guy was sooooo funny......"Mom...PLEASE get the heated towel racks to go with the heated floor!" What a cutie! It was great to run into you and Nicholas. Maybe I should put Sean in charge of the remodel... he seems to have good taste. Of course, he'd surely blow the budget! I want to see pics of your bathroom!! hello, I read it twice and laughed out loud twice! I live with a great big Marty and a couple of Marty look alikes. I am building should be done in a month or so. I am doing a jazz tub free standing center of a 12 foot wall with two smallish vanities on either side. White with Black Pearl Granit. I have purchased 36" round mirrors above each and tiny 4" mini pendants on each side. It will be I think a great wall in my minds eye. I want the glass knobs for pulls but I had to draw the line or rather upgrades to the flooring. We have a 8 x 12 in a staggerd patter. My mom did not come shopping with me and against my better judgement I picked a tile that is white (as close to marble colors I thought) with a fine grey barcode texture. Hopefully me and my black hair wont have too much regret. 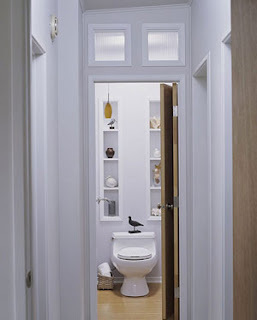 I gush over everyones marble but .... Anyways enough already, my question to you is this; What are you putting in your water closet for storage is it large enough for a small cupbard? The Marty's dont need to look at the unmentionables and I would rather store the tp where it wont be splashed. I'm Enjoying your blog please continue. Dawn, it sounds fabulous! I would love to see pictures when you're done. Love the mini pendant idea... wish I could've done that, but our cabinetry is taking up too much space around the mirrors. I'll be doing a blog post shortly on my lighting frustrations :) To answer your question, I haven't chosen anything for the water closet yet, but I would love to hang a little storage cabinet above the toilet. I'll be looking into that this weekend. So glad you are enjoying the blog. Please keep visiting, and keep me posted on your bathroom. Plumbers are very useful in all kinds of situations. They are a great help in times of need. It's great that they can be reached anytime that their service is needed.